A key component to SIU’s uniqueness is its ability to provide the brains of a research university while maintaining the heart of a small college. According to the college’s mission statement, the faculty at the College of Business supports and celebrates discovery that pushes the boundaries of what is known and what has been done. The college continues a tradition of knowledge creation through the production of basic and applied research with real business and societal impact. This summer, the college awarded nine faculty research grants to sustain the type of research on which the reputation of the college has been built. All four major areas of study at the college – accounting, finance, management and marketing – are supported by the grants. Cheryl Burke Jarvis, marketing professor and associate dean, who earned recognition for having her research cited frequently by other professionals in the field. She is featured in a recent edition of the “Journal of Marketing Education” in an article titled “Global Benchmarking of Marketing Doctoral Program Faculty and Institutions by Subarea.” The article ranks Jarvis fourth among scholars in the United States and seventh worldwide for consumer behavior research, with 527 citations from her work recorded between 2003 and 2012. Wanli Zhao, associate professor of finance, who earned the 2014 Best Paper Award for corporate finance from the Financial Management Association (FMA), the national organization for finance academics. His winning paper, titled “Shadow Trading: Do Insiders Exploit Private Information about Stakeholders?” was up against a record number of submissions. He received the award at an October FMA meeting. Darla Karnes, senior lecturer in accounting and online accounting program manager, who accompanied a group of students to Grenoble, France, to learn about international business at the world-renowned Grenoble Ecole De Management (graduate school of management). Students took two courses – international marketing, and small and family business, each lasting two weeks – during their stay in Grenoble. Upon completion of the courses, students received 15 credit hours and a minor in marketing. Programs such as this provide our students with a global view of business – and a level of professionalism that only comes from experiences. Tom Downen, assistant professor of accountancy, who earned a nomination for the National Teaching Innovation Award at the annual American Accounting Association meeting for his creativity in the classroom. Downen rewrites songs to address accounting topics covered in intermediate accounting courses. Greg DeYong, assistant professor of management, who was featured in the September/October issue of APICS Magazine. APICS is the leading professional association for supply chain and operations management. The feature highlights DeYong’s efforts to stay informed on current business trends and innovations, along with his involvement with APICS locally. DeYong encourages his students to get Certified in Production and Inventory Management (CPIM); in fact, he is working on his own certification. These are great examples of implementing the college’s mission statement, and the commitment to offering transformational and relevant classroom experiences in a curriculum that integrates cutting-edge business knowledge. 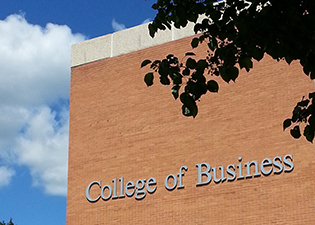 The College of Business is proud of its faculty members and their unyielding dedication to the growth and development of their students, and to the mission of the college.